Victoria and Alferd museum, a not-for-profit institution founded by Prune Victoria and Ingalil Alferd. The collection is based on personal curiosity, an interest for mistakes and tautological anomalies. woollen glove, urushi, gold, 20 x15 x 7cm (No. 923). 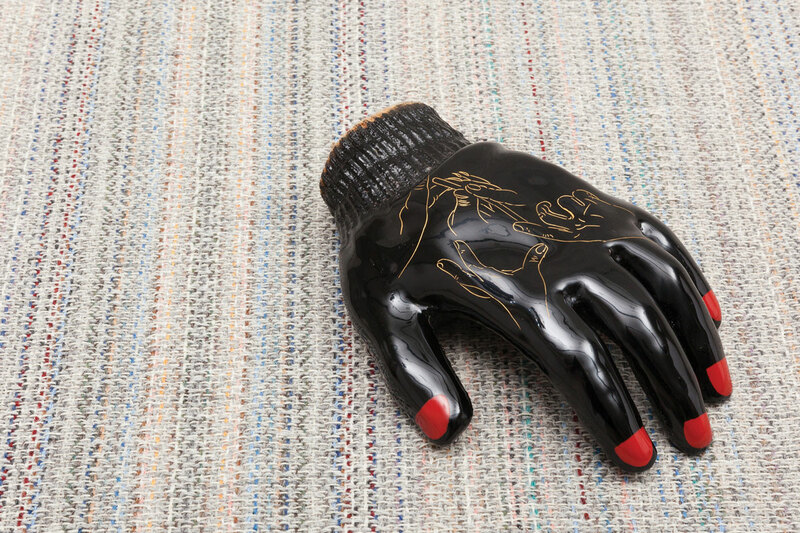 This woollen glove was lacquered by Kazutaka Furukomi in the town of Wajima in Japan, famous for its long tradition of urushi. Furukomi san explains that the painstakingly long process of lacquering, each of the dozens of layers taking a week to dry was made difficult by one of his hand being kept in the very glove he was asked to work on. Until the object had hardened enough to release his hand, he had to design contraptions to shower, sleep or do any seemingly mundane activities requiring both hands to keep it dry and immobile. Finally, Furukomi-San was asked to decorate the object in chinkin by engraving in gold the different stages to create it.